From memory, I think there is an actual limit in volume??? 2ml is ringing a bell??? How are they going to get the nic equivalent of 50 cigs in 1 cartrige ?? They certainly can't do it if the limit on nicotine is 20mg/ml. They really don't know what they're doing do they. The ENVI committee voted in favour of the new proposals, 49 - 7. I don't know why people are getting so upset over this. This was expected. The aim now is to get enough signatures to re-open article 18, and set things right for the big plenary vote in March, as described by Martin Callanan. 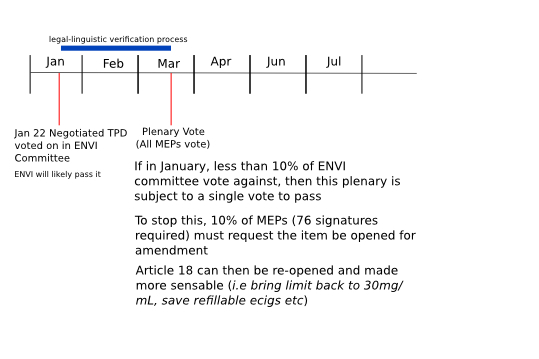 I'm still waiting for info on whether the 7 votes in the ENVI committee was the 10% needed to reopen article 18 already, or if 76 MEP signatures are required by March. margyb and Rose like this. definitely not if the limit is 2 ml at 20mg/ml. my understanding is that the average ciggie delivers around 1mg of nic. a 30 a day smoker is therefor getting 30mg of nic per day. when vaping, around one third of the nic is absorbed, so to get the 30mg you'd get from a pack of 30 smokes you'd need to be vaping approximately 90mg of nic. that would be 5ml of 18mg/ml juice. definitely not 2 ml of 20mg/ml juice. a) nicotine-containing liquid is only placed on the market in dedicated refill containers not exceeding a volume of 10 ml, in disposable electronic cigarettes or in single use cartridges and that the cartridges or tanks do not exceed a volume of 2 ml;"
I think it is debatable whether it is 2ml or not for refillable. I remember some were reading the above as 2ml max for all tanks and some were reading it as only applying to disposables?? I think this was because it was a hotch potch of versions all put together. Note the phrase "in dedicated refill containers". In other words, vendors can sell a prefilled 1.6mL CE4 stardust. But they can't sell a prefilled 3.0mL Vivi Nova. However, they can sell an empty Vivi Nova, and a 10mL bottle of ejuice. 1. The 20mg/mL limit needs to be raised back to 30mg/mL. A significant portion of vapers are under a serious threat due to the limit. 2. Advertising. This needs to be allowed. Even if they ban Advertising, there has to be some Mandate to force Governments to inform their citizens about electronic cigarettes. Smokers have a right to know that there are safer alternatives. 3. The over hanging threat of refillable ban. If three European countries decide to be dicks and team up and say all 1.6mL Stardusts are banned, then stardusts get banned all across Europe. This is a stupid law that needs to be squashed. Other issues concerning nic levels above 30mg/mL and volumes should just be suppressed at the moment. At the end of the day, those companies that wish to sell ejuice in bottles larger than 10mL and nicotine above 30mg/mL will have to take the Government to court. I believe the global number now is 7 countires who's court systems have rejected the medicinal regulation of these products. 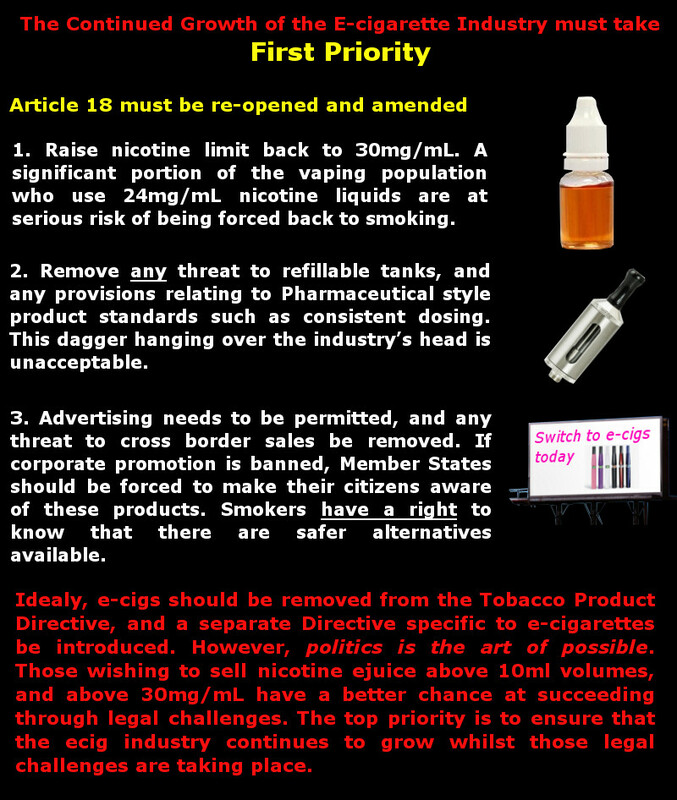 are safe, the ecig industry can continue to grow whilst legal challenges are taking place. Continuation of ecig industry growth is the number one priority. The rest can be dealt with in time. Last edited by mavinry4; 23-01-14 at 03:04 PM. margyb, Crisscross, lozza 82 and 2 others like this. margyb and Donna like this. Not surprising the European Commission have misinterpreted Dr Farsalinos research and have gotten it completely wrong. Interesting read about the nicotine absorption levels, although I couldn't see myself vaping 50mg juice lol. mavinry4 and Donna like this. European Conservatives and Reformists Group leader Martin Callanan today refused to back an agreement reached between MEPs and national governments that would significantly over-regulate electronic cigarettes, taking many of these devices off of the shelf. The parliament’s environment committee was asked to endorse the agreement in a single vote this afternoon on the Tobacco Products Directive. The agreement reached in the early hours of the morning last December would enable an EU-wide ban on ‘refillables’ (which comprise a large component of the e-cigs market), if only three EU countries ban them. It would also restrict all but the weaker e-cigarettes (20 mg/ml nicotine). The parliament had previously voted against a proposal that would have required e-cigarettes to undergo a costly ‘medicinal’ authorisation route (which would have only benefitted major tobacco companies), but the draconian measures introduced by a handful of MEPs and national government representatives go a long way to reinstating the draconian legislation that MEPs voted against, Mr Callanan warned.